I discovered Ella somewhere back in the dark ages as a teenager on some greeting card-store greatest hits album. That record basically wrote my definition of “standards”. 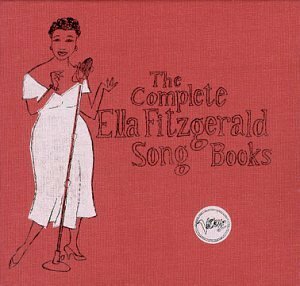 Little did I know, most of those recordings were lifted directly from the seminal set of Ella Fitzgerald Sings… series released on Verve between 1956 and 1964. These are some of the finest interpretations and, most markedly, some of the best arrangements of songs that are now nothing short of legendary by some of the greatest composers & songwriters of the 20th century. With arrangers including Buddy Bregman, Nelson Riddle, Duke Ellington and Paul Weston, it’s no surprise that these recordings have stood the test of time. It’s fascinating to hear the different ways in which each arranger and each Ella era influences the different collections from each different composer. Some of the Bregman arrangements from …the Cole Porter Songbook are a little languid for my taste, but then treasures jump out like “Begin the Beguine” and “Night And Day”. I’ve always felt the song book albums really hit their stride with Nelson Riddle’s arrangements. Just the perfect balance between jazz & pop, lush yet swinging. Check out “Skylark” on …the Johnny Mercer Songbook or “Our Love is Here To Stay” from …the George and Ira Gershwin Songbook. And yet, nothing really compares to the Duke Ellington/Billy Strayhorn songs (is it clear yet that I love all of these like they were my children?). Ellington is a master and Ella’s voice sits so well on tunes like “Solitude” and she really lets it rip on “Perdido” and “It Don’t Mean A Thing…”. It sounds like she’s singing something from a place of great familiarity more so than on most of the others. If you’ve got the time and the tolerant roommates, I highly recommend digging through this treasure trove of the American song. You won’t regret spending a few days with someone as delightful as Ms. Fitzgerald.